Three new Tissot Classic Prince timepieces share memories of an arduous journey between Russia and Le Locle, Switzerland in 1917. A wristwatch sold to an important diplomat in Russia in 1916 and sent to Tissot for maintenance and safekeeping at the outbreak of the revolution a year later, inspires today’s range. The contemporary Tissot Classic Prince watches vividly recreate Art Deco style, integrating 18 carat rose gold and a mechanical movement protected by a screw-down case. These new Tissot Classic Prince limited editions have all it takes to turn into tomorrow’s treasures. The solid gold, rectangular case of the three new watches adopts the same ‘banana’ shape as their famous ancestor, now safely housed in the Tissot museum in Le Locle. It curves around the wrist, mirroring the soft contours. The Art Deco theme embraces both the lines of the watch and the design of the swirling numbers, with their varying size cleverly fitting them into the dimensions of the slim, rectangular dial. 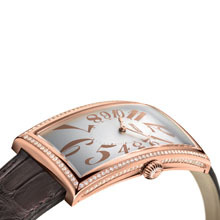 A historical Tissot logo on the dial and delicate bleuté hands add touches of romantic nostalgia. Ensuring the seal of modernity, the new Tissot Classic Prince contains a Swiss made 17-jewel mechanical movement and is water resistant to a depth of 30 metres (100 feet). The Tissot Classic Prince Diamonds frames a silver-coloured dial with 165 diamonds of 1.08 carat Top Wesselton vvs quality. Completing the classical trio is a Tissot Classic Prince with a black dial with or without diamonds. All models are attached securely to the wrist by a genuine crocodile leather strap in an up-to-the-minute shade of chocolate brown and with a stylish folding buckle. A finely textured crown represents a common signature of elegance on the watches. The new timepieces magically recapture the mood of a bygone age, in family heirlooms of the future.